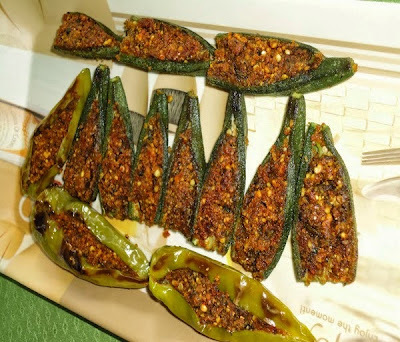 Bharli bhindi recipe - Bharli bhindi and bharli mirchi or stuffed ladies finger and green chilly recipe - Bharli mirchi and bharli bhindi are my favorites. The stuffed chilli and okra are great accompaniment to the main course. This can be wrapped in phulka and chapati to serve as a roll, or to pack in the lunch box. I have prepared them several times and thought to share the recipe with you. 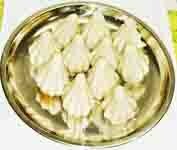 Another important thing is that the same filling can be used with capsicum, bitter gourd and ridge gourd. The dry filling powder can be used to make peeth perun bhaji with vegetable such as ivy gourd, cluster beans, capsicum, ridge gourd, radish and spring onion. Roast the bengal gram flour till aromatic and golden brown. Set aside. Roast the peanuts, remove the husks and blend it to a coarse powder. Set aside. Heat 1/2 tbsp oil in a frying pan and add hing powder to it. Saute till aromatic. Now add coriander powder, cumin powder, chilli powder, kala masala or garam masala, turmeric powder, roasted gram flour, groundnut powder and stir very nicely for 2 mins on low flame. Remove from the flame and add amchur powder, coriander leaves, salt and 1 tbsp oil to it. Mix very well and knead them gently. Use this filling to stuff the chilli and okra. Now wash the chillies and okras. Remove the stem and slit the chilliin the middle keeping the top and tip intact. Chop off the stem of the bhindi and slit it keeping the lower part intact. Cut the tip. Stuff all the bhindis and chilles properly. Then heat a tawa / griddle and apply oil on it. Place the stuffed chillies and okras on the tawa. Pour remaining 1/2 tbsp oil on all okras and chillies. Roast them on medium flame, flipping in between, till they become light brown colour. Serve the bharli bhindi and bharli mirchi with choice of your main course. I love all stuff vegetables, this looks so yummy specially mirchi. have to make this soon. Expecting this for a very long time.Visit my blog when ur free. Those stuffed veggies are just making me drool..
wow well made stuffed veggies, simply drooling here..
wow so very delicious stuffed bhindi and mirchi :) am drooling here !! Hi Vidya, your stuffed chillies and ladies fingers look really delicious. Very appetizing dish. Thanks for sharing. Looks very delicious and yummy.